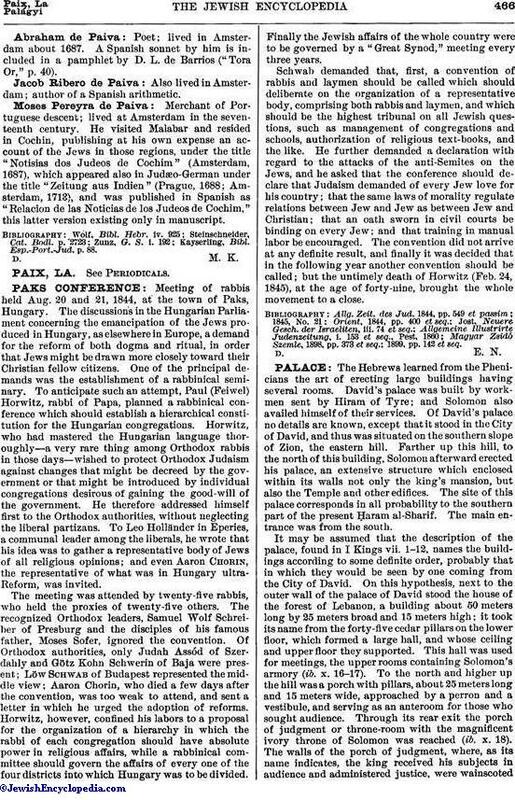 Meeting of rabbis held Aug. 20 and 21, 1844, at the town of Paks, Hungary. The discussions in the Hungarian Parliament concerning the emancipation of the Jews produced in Hungary, as elsewhere in Europe, a demand for the reform of both dogma and ritual, in order that Jews might be drawn more closely toward their Christian fellow citizens. One of the principal demands was the establishment of a rabbinical seminary. To anticipate such an attempt, Paul (Feiwel) Horwitz, rabbi of Papa, planned a rabbinical conference which should establish a hierarchical constitution for the Hungarian congregations. Horwitz, who had mastered the Hungarian language thoroughly—a very rare thing among Orthodox rabbis in those days—wished to protect Orthodox Judaism against changes that might be decreed by the government or that might be introduced by individual congregations desirous of gaining the good-will of the government. He therefore addressed himself first to the Orthodox authorities, without neglecting the liberal partizans. To Leo Holländer in Eperies, a communal leader among the liberals, he wrote that his idea was to gather a representative body of Jews of all religious opinions; and even Aaron Chorin, the representative of what was in Hungary ultra-Reform, was invited. The meeting was attended by twenty-five rabbis, who held the proxies of twenty-five others. The recognized Orthodox leaders, Samuel Wolf Schreiber of Presburg and the disciples of his famous father, Moses Sofer, ignored the convention. Of Orthodox authorities, only Judah Assód of Szerdahly and Götz Kohn Schwerin of Baja were present; Löw Schwab of Budapest represented the middle view; Aaron Chorin, who died a few days after the convention, was too weak to attend, and sent a letter in which he urged the adoption of reforms. Horwitz, however, confined his labors to a proposal for the organization of a hierarchy in which the rabbi of each congregation should have absolute power in religious affairs, while a rabbinical committee should govern the affairs of every one of the four districts into which Hungary was to be divided. Finally the Jewish affairs of the whole country were to be governed by a "Great Synod," meeting every three years. Schwab demanded that, first, a convention of rabbis and laymen should be called which should deliberate on the organization of a representative body, comprising both rabbis and laymen, and which should be the highest tribunal on all Jewish questions, such as management of congregations and schools, authorization of religious text-books, and the like. He further demanded a declaration with regard to the attacks of the anti-Semites on the Jews, and he asked that the conference should declare that Judaism demanded of every Jew love for his country; that the same laws of morality regulate relations between Jew and Jew as between Jew and Christian; that an oath sworn in civil courts be binding on every Jew; and that training in manual labor be encouraged. The convention did not arrive at any definite result, and finally it was decided that in the following year another convention should be called; but the untimely death of Horwitz (Feb. 24, 1845), at the age of forty-nine, brought the whole movement to a close. 1899, pp. 142 et seq.